Maison Ferraton Pere et Fils was founded in 1946 by Jean Orens Ferraton, which as you can see, is where the company takes its name from. The initial purchase that launched their business began with a tiny parcel of only .3 hectares in Hermitage. The next generation, led by the dynamic Michel Ferraton really helped expand the business and their vineyard holding with additional purchases. In 1998, Ferraton Pere et Fils embraced biodynamic farming techniques for all their vineyards. They also really wanted their business to grow. To help with the transition, Michel Chapoutier, who was already enjoying great success with biodynamic farming and marketing the wines of Chapoutier was brought in. From that point forward, they formed a join venture partnership with Michel Chapoutier. By 2000, all their vineyards were farmed using biodynamic techniques. Today, due to a motorcycle accident that severely injured Samuel Ferraton, Michel Chapoutier took a more active roll in the management of the entire estate. It took a few years, but starting with the 2009 vintage, all their wines showed a marked increase in quality. 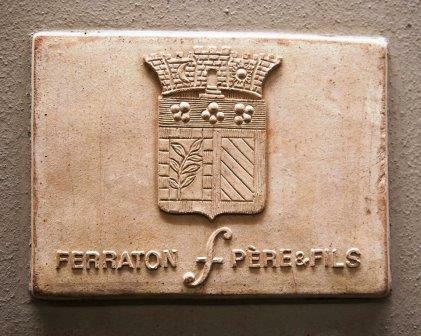 Ferraton Pere et Fils is a massive company in the Rhone. They are a winery, producing some of the top wines in the Northern Rhone, especially in Hermitage and Corzes Hermitage. They own vines in several appellations. In Hermitage, they have vines planted in Le Meal, Petit Meal, and Beaume. They have old vines, some of which are close to 60 years of age on Le Meal, with their oldest vines dating back to 1946, which are in the Les Diognieres lieu-dit. They also act as a negociant and produce wine from purchased in a myriad of appellations including: Crozes Hermitage, St. Joseph, Cote Rotie, Condrieu, Cornas, Chateauneuf du Pape, Cotes du Rhone, Cotes du Rhone Villages Plan de Dieu and Tavel. They make both red and white wine in the Rhone Valley, with a focus on red wine. In Hermitage, Maison Ferraton produces 3 red Hermitage wines and 3 white Hermitage wines. Ferraton Pere et Fils Le Meal is their most famous and expensive wine. Produced from a small parcel of old vine Syrah planted in the steep granite hillside soils of the Le Meal vineyard, their vines are placed in one of the cooler terroirs of the lieu-dit. Due to their unique cooler, and naturally moist terroir, coupled with the age of their vines, they are often one of the last estates to finish harvesting. For the production of their wines, the grapes are completely destemmed. Vinification takes place in concrete vats. Malolactic fermentation is in barrel. The wine is aged in 30 to 50% new, French oak barrels and demi-muids for between 14 to 18 months. The amount of new oak and aging time varies, depending on the quality and character of the vintage. Very little of this wine is made as the production of Ferraton Le Meal is under 200 cases per vintage. Ferraton Pere et Fils Les Dionnieres Ermitage is produced from old vine Syrah. The grapes are destemmed and then vinified in traditional concrete vats. The wines are aged in 20 to 30% new, French oak barrels and demi-muids for 14 to 16 months before bottling. This wine is hard to find because the production of Ferraton Les Dionnieres Ermitage is under 200 cases per year. Ferraton Pere et Fils Cuvee des Miaux comes from a terroir of clay, limestone and alluvial soils from vineyards in Les Dionnieres and Le Meal. The grapes are sourced from their own vines and blended with purchased fruit from other growers. The wine is aged in 10% new, French oak barrels for 14 to 16 months. Ferraton Pere et Fils Hermitage Blanc le Meal Estate is produced from 100% Marsanne, although some Roussanne can be added in select vintages. Vinification takes place in barrel. The wine is then aged in a combination of French oak barrels and vats for 10 to 12 months. Ferraton Pere et Fils Hermitage Blanc Le Reverdy is made from a blend of 50% Marsanne and 50% Roussanne that is barrel fermented and aged on its lees in 30% new, French oak barrels for 10 to 12 months. Ferraton Pere et Fils Les Miaux Hermitage Blanc is made from a blend of 50% Roussanne and 50% Marsanne. The wine is vinifierd in barrel and is aged in demi-muids for 10 to 12 months. Ferraton Pere et Fils Hermitage when young, should be decanted at least 2-4 hours, give or take, allowing the wines to soften and open their perfume. Older vintages might need very little decanting, just enough to remove the sediment. Ferraton Pere et Fils Hermitage is usually better with 10-12 years of cellaring and should be at its best between 12-30 years of age. Ferraton Pere et Fils is best served at 15.5 degrees Celsius, 60 degrees Fahrenheit. The cool, almost cellar temperature gives the wine more freshness and lift. Ferraton Pere et Fils is best served with all types of classic meat dishes, veal, pork, beef, lamb, duck, game, roast chicken, roasted, braised and grilled dishes. Ferraton is also good with Asian dishes, hearty fish courses like tuna, mushrooms and pasta. The white wine of Ferraton is best served with a myriad of different seafood dishes, shellfish, crab, lobster, sushi, sashimi, chicken, pork and veal, as well as Asian cuisine. From time to time, Maison Ferraton has produced a Vin de Paille. And as I mentioned earlier, they also produce a massive array of wine from various appellations all over the Northern Rhone and Southern Rhone Valley. Power, depth, concentration, firm tannins and aromatics loaded with olives, rock, red fruits, thyme and smoke work well here. The wine is rich and a lot of energy, and tannin, so give it 7-10 more years and enjoy the fireworks. Rich, fat, dense and concentrated, the honeysuckle, buttery citrus and stone really stands out here. The wine was produced from a blend of 50% Marsanne and 50% Roussanne. This might still be primary, but there is so much fruit, the tannins are plush and ripe and the concentration is there, it's hard not to see a great future for this wine. Inky dark in color, powerful, rich and deep, 3 hours in the decanter really helped the wine. Another decade in the cellar will however, help a lot more! Medium/fudied, with ripe, fresh, crisp red fruits, licorice, smoke and herbs, the wine has soft, supple tannins and plenty of sweet, ripe, peppery fruits in the finish. You can drink this now, or age it for more development. I really like the style of 2003 Hermitage wine. 2003 is a mixed bag for most European appellations, but it really works in Hermitage. With lush, fat, rich, round textures, sweet, ripe and fruits that easily slide from the glass down your palate, the wine has weight, richness, complexity and length. Cuban tobacco, cassis, minerals and fresh black pepper with cherry pipe aromatics. Concentrated with dull fruit that ends with baked cherry pie and ashtray flavors. Fully developed, with a mix of spicy red fruits and tobacco to get this going the wine leaves with soft, spicy, red, peppery, red fruits and earthy sensations. This is at full maturity.